Keep tap water healthier and tasting better when you regularly change your Brita replacement filter. 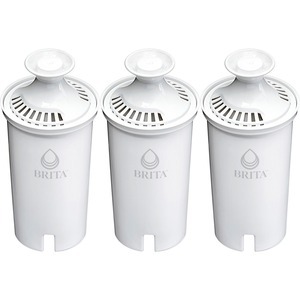 Made to fit all Brita pitchers and dispensers, this replacement filter reduces copper, mercury and cadmium impurities that can adversely affect your health over time while cutting chlorine taste and odor to deliver great tasting water. Designed to leave no black flecks in your water and with no pre-soak required, the Brita filters are quick and easy to use. Change your Brita filters every 40 gallons or approximately 2 months for best performance. Start drinking healthier, great-tasting water with Brita today.